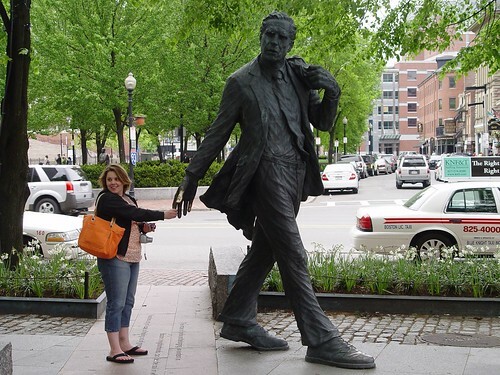 Took this shot in Boston a couple weekends ago…the statue is one of our old mayors, Kevin White. Umm, I’ll take a number three to go please . That sign cracked me up too. These definitely got a laugh and a smile out of me!! I’ll take #3 every time…. Those are all totally awesome. I especially like the one of the sign. Too, too, funny!!!! Hahha I love signs with a little sarcastic/silly twist! I will pay tribute to #3 anyday! You know I love your photos, but that sign with the fish smoking made me laugh, and the crotch shot made me want to drool. Well it makes me smile — and a little dizzy. Too funny. That is one giant statue!!! Hilarious, I think you made us all laugh! Thanks! hehe on #2! I love that sign! My reaction to #3 was entirely unexpected. Jeez. nice pictures. Mmmmmmm. I played! Hey – I am a former Boston Gal and I forgot that Kevin White was the mayor at one time! Pretty sad. The sign is pretty funny. Is it just me or is that billboard in 3-D? 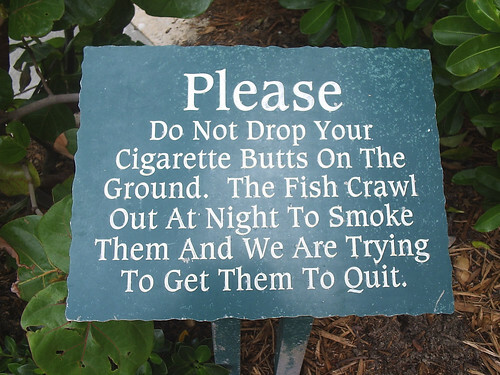 Whoa… #3 would make me happy, but my imagination ran riot about fish smoking. Great sign. OBTW, I tagged you for a short meme so if you’re interested come by and get it. Photos 2 & 3 made me smile!! Especially 3!! Oh and I agree with Mrs G, the billboard is in 3D!!! IMAX even!! That sign is hilarious!! Love all three pics. I love the smoking duck approach. Give Wolf a pat for me. I will take a pass on #3, but that sign is about the funniest thing I have seen in awhile!! My buddy has been virtually living in Boston the past few months! I played as well…late…again…but I played…great job! OMG. How much do I love that sign from Atlantis??? ?